Artist Jan Dilenschneider and her husband Robert donated $250,000 to the International Institute of Education Scholar Rescue Fund to establish a fund for oppressed artists in conflict-filled countries. It was Christmas 2013 and Jan and Robert Dilenschneider were brainstorming ideas of how they could give back to the community. Robert, who is on the board of trustees of the International Institute of Education, knew just what to do. The Darien couple donated $250,000 to the Institute of International Education Scholar Rescue Fund, and on Feb. 25 the Janet Hennessey Dilenschneider Scholar Rescue Award in the Arts was established to aid oppressed artists and scholars from their dangerous and restrictive home countries. "Saving artists is every bit as important as saving technologists and engineers and people related to the business world," Mark Angelson, chairman of the IIE-SRF, said. "This is literally education that we're saving." Jan Dilenschneider said the world learns from the culture of the past. "We wouldn't know anything about the Greeks and Romans if not for the sculptures and wall paintings that remain," Dilenschneider said. "We learn from that. We learn from what has been and how we're connected to the past." So often, Dilenschneider said, a man working in technology at a desk all day long will come home, sit down, take a breath and turn on music while looking at a piece of art on his wall. "Artists are the solace," Dilenschneider said. "It's extremely important that we not lose the arts of countries of tremendous oppression. It's important that we bring these people out." In 2003, Iraqi scholars' lives were in extreme danger, and the targeted campaign to assassinate the intellectual class picked up speed in 2005, according to Jim Miller, the director of the Scholar Rescue Fund. "The blood of Iraq's intellectual class flowed in the streets," Miller said, noting that there were some days when dozens of scholars were killed. Since 2003, 551 Iraqi scholars have been assassinated, 23 of which occurred in the last 18 months. "By killing one academic, you're causing a thousand more to flee," Miller said. "You're destabilizing the intellectual fabric of the country." One such scholar is an Iraqi artist and scholar who fled Baghdad in 2006 to Paris. "I had to flee," said the artist, whose name is being withheld to protect her privacy. "Some of our colleagues in the fine arts were being killed." She said she has spoken with friends of hers since leaving her home country and they tell her that had she stayed she would also have been killed. She knows she still can't return and the situation would be even more dangerous for her. "I lost my job, I lost my home and everything I had built," she said. "I left my country and I wasn't very young. I had to start again from scratch and it's hard to start again." She now lives in London where she is a private artist with the help of the Scholar Rescue Fund. Though she was a teacher of fine arts in London for one year, she felt the need to work as an artist. "For me, to be an artist is more powerful (than to be a teacher) so you can make your voice heard through the art," she said. She is a mixed-media artist and has expressed her views through paintings, photography, sculptures, video and more. She has been told her work has a violent tone to it and conveys political messages, but she said she is not a political artist, though some politics should be conveyed through her work. "It's there -- it's all around us," she said. "All Iraqi artists have political issues in their work." Miller said the reason why the scholars are being targeted is known, though who is doing the assassinations is not so clear. "Very often, it's the scholars that voice their opposition and have the ability to fight change that is not good for the country," Miller said. While a system of higher education still exists in Iraq, Miller said it does not have the same open voice that it once maintained. "The system of education has collapsed," the artist said. The assassins' goal, she said, is not to destroy the tangible buildings but to destroy its internal educational structure. Before Edward R. Murrow earned his fame for his broadcasts starting with "This is London" during World War II, he served as an assistant director of the IIE. One of his goals was to coordinate scholar rescue efforts in Europe. "And we just kept doing it," Angelson said. The scholar rescue efforts continued through the 1950s and '60s with no dedicated fund or staff. "We perhaps missed opportunities to help people." And so, in order to make sure that future opportunities would not be missed, the IIE established a dedicated Scholar Rescue Fund whose primary focus was to remove oppressed scholars from dangerous areas of conflict. Since the fund was founded in 2002, 526 scholars have been taken from more than 50 countries and transported to safe havens in 40 other countries, including the U.S. The Iraq Scholar Rescue Project has saved the lives and work of more than 275 of Iraq's most senior and threatened academics in a wide range of disciplines through temporary positions at universities, colleges and other institutions of higher learning in the Middle East and North African regions, according to the IIE. Recently, the IIE-SRF reviewed a handful of applications from Syrian scholars. "Education is the orphan of every war," Angelson said. "People generally think of humanitarian aid as food and shelter. Education comes last. Though we're not on the ground doing work of providing food and shelter and bandages, when we take one person out, that has an effect." Through the program, the artists are brought from their conflict-torn countries and into a host university where they will be able to continue their work and will teach at the same time. The Scholar Rescue Fund matched the Dilenschneiders' $250,000 donation, and each host university will also provide another match, Angelson said. Ten scholars will be selected over the course of five years and given a $25,000 stipend. What's more, a book will be created that will explore what each artist has learned in his or her time at the host university. Titled "From Oppression to Expression," the book will allow the artists to express their feelings or highlight areas of wrongdoing from their countries, Dilenschneider said. "We don't feel that oppression here," Dilenschneider said. "We don't feel what it's like to be in Iran and not know if we're going to have nuclear bombs dropped on us or create them and have them explode on us. Even though we're safe here, there are a lot of people who are not. We keep reminding ourselves that there are a lot of people who need a lot of help." 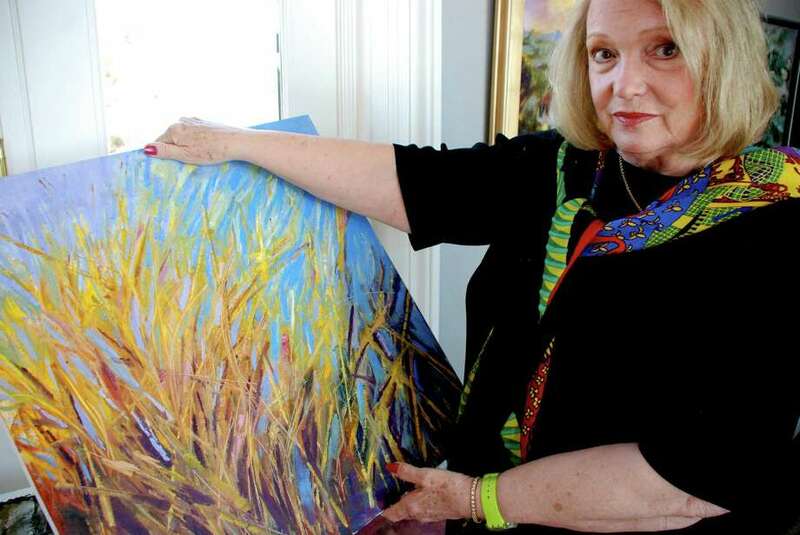 Dilenschneider, who is also an artist, said her involvement with the Scholar Rescue Fund has changed her artwork. "When you look at the canvas, it should talk for itself; you don't have to explain it," Dilenschneider said. She has started a series of landscapes. "The whole thing is that we should stop and think about what we are doing to this world as people."